We wonder why a big brand like Magnum does not have a nutrition label on the pack. 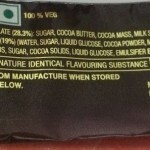 While reviewing this product we note that in a 90 gm bar of it there is 24 gm sugar and which is high and unsuitable for diabetics and those suffering from lifestyle diseases. Also, unlike traditional high quality ice creams which people assume to contain only dairy fat, we note that Magnum contains vegetable fat. 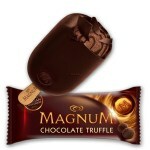 Magnum Chocolate Truffle contains edible vegetable fat and does not specify the source. So one does not know if they have used hydrogenated or partially hydrogenated vegetable oils by using the term “edible vegetable fat”. Hydrogenated fats are a source of trans fatty acids or “trans-fats”, which are harmful to health. Trans-fats increase the likelihood of heart disease, stroke, cancer and many other ailments. Magnum Chocolate Truffle contains wholesome ingredients like milk and cocoa, but it is a dessert containing a lot of sugar and is not a meal replacement. This food product does not specify which sugar has been used. This is important because different sugars have different metabolic effects. For example, Sucrose (Cane Sugar) is very different from Fructose (Fruit Sugar). Some foods use high fructose corn syrup which may be harmful in much lower quantities than sucrose. We believe that it is not responsible behaviour for a brand to not clearly state what ingredients have been used. Glucose syrup, also known as confectioner’s glucose, is a syrup made from the hydrolisis of starch. Glucose is a sugar. Often brands tend to obscure the fact that they have used hydrogenated or partially hydrogenated vegetable oils by using the term “edible vegetable fat”. Hydrogenated fats are a source of trans fatty acids or “transfats”, which are harmful to health. Transfats increase the likelihood of heart disease, stroke, cancer and many other ailments. This food product does not specify which edible vegetable fat has been used. We believe that it is not responsible behaviour for a brand to avoid clearly stating what ingredients have been used. A vegetable oil is a triglyceride extracted from a plant. Such oils have been part of human culture for millennia. The term “vegetable oil” can be narrowly defined as referring only to plant oils that are liquid at room temperature, or broadly defined without regard to a substance’s state of matter at a given temperature. For this reason, vegetable oils that are solid at room temperature are sometimes called vegetable fats. A natural polysaccharide, produced from the guar shrub (Cyamopsis tetragonolobus) found in Pakistan and India. It is used as a thickening agent, stabiliser and emulsifier. No side efects known, although high concentrations bring about flatulence and bloating, due to fermentation by the intestinal microflora (in the same way as all indigestible polysaccharides). A natural polysaccharide, produced by different seaweeds (Chrondrus crispus, Gigartina stellata, Euchema spinosum, E. cottonii) in Europe, Asia and America. It is a complex mixture of polysaccharides. E407a has a slightly different composition; moreover, it contains a considerable amount of cellulose. It is used as a thickening agent and stabiliser. No side effects known, although high concentrations bring about flatulence and bloating, due to fermentation by the intestinal microflora (in the same way as all indigestible polysaccharides). Short-chain carrageenan may cause intestinal leakage and are not permitted for use in foods. Disclaimer – The information on this website is not intended to replace a one-on-one relationship with a qualified health care professional and is not intended as medical advice. It is intended as a sharing of knowledge and information. foodnetindia encourages you to make your own health care decisions based upon your research and in partnership with a qualified health care professional. The ingredients list of the products may have changed since this page was published. Consumers are encouraged to read warnings, labels, ingredient lists, etc.